Strumming it with the greats! The principle is simple, play the notes presented in keeping with the song being played. So that song happens to Be a great hit, so? Well hey! YEAH! 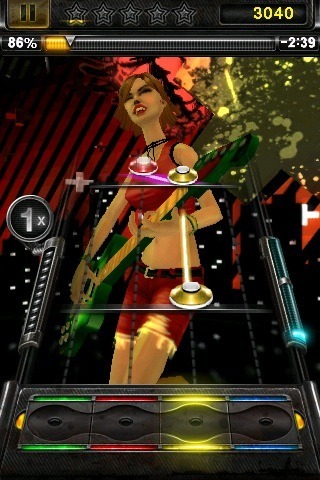 The game is played by hitting notes at the bottom of the screen coloured green, red, yellow and blue as the appropriate note reaches that button as the song progresses and therefore the notes: from the top of the screen down. The area you use to play the note is called the ‘note catcher‘. It’s a wonderfully simple concept and works well, if less realistically than the PS3 or even DS versions. 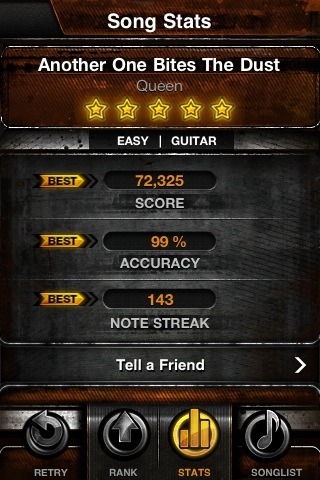 For example, you do tend to play the iPhone version with you thumbs rather than your fingers. There are simple notes, chords, strums, accents and sustains to cope with and later, at the hard and expert levels, slides. Chords are simply more than one note at the same time. 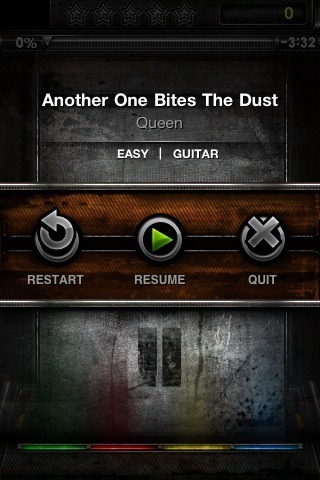 Tap the appropriate buttons simultaneously. Obviously indicated by two notes passing at the same time. 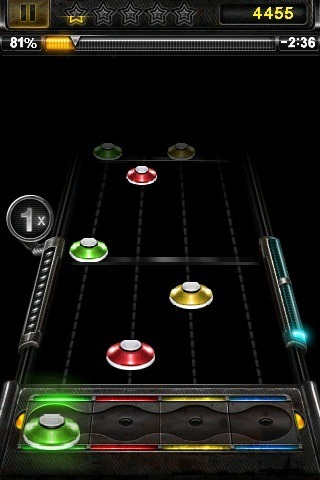 Strums are quick ‘flicks’ in the the direction indicated. Strums are therefore indicated by a series of arrows starting at a particular key/colour and moving left or right. Accents are a bit simple as all you need do is press any of the coloured notes at the appropriate time. Accents are indicates with an orange bar across the entire screen. Sustains are literally held notes, or sometimes chords. To play simply hold the appropriate note(s) for the duration indicated by the vertical line from that/those key(s). Slides are, in my opinion, easily the hardest note to get correct. These are notes are indicated by a diagonal line attached to and joining each note. To play it you simply slide from one note to the next indicated without releasing the ‘note catcher’. 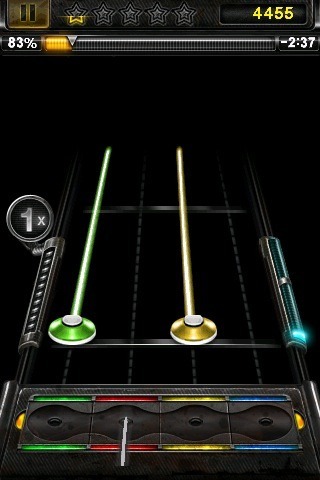 After you’ve mastered the notes you will notice that there appears a blue bar above the note catcher. 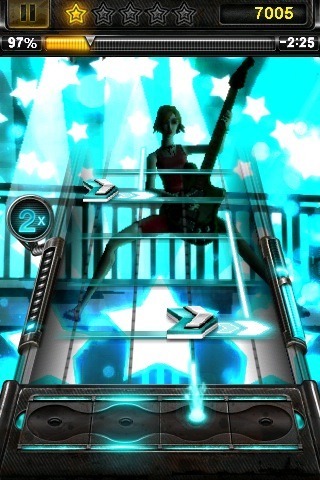 This is to activate Star Power which will double your score per note played for a short time. Star Power is available after you half fill the meter on the right. This is done by completing the sequences of starred notes. Another way of gaining Star Power is to ‘reverb’ the sustain notes, or as they call it Whammy them. Simply wiggle your finger/thumb a little on a sustain and that’ll do the trick. In principle all you need to do is follow the notes and you’re away! 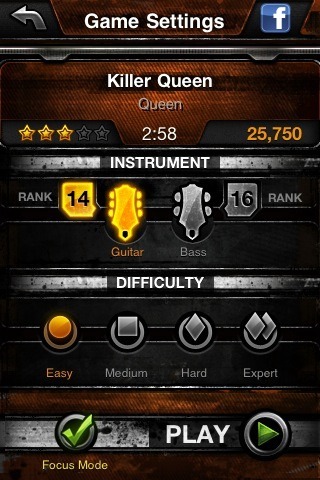 Within the game are challenges that give you specific targets, like a string of consecutive notes or activate three Star Powers in a single song. 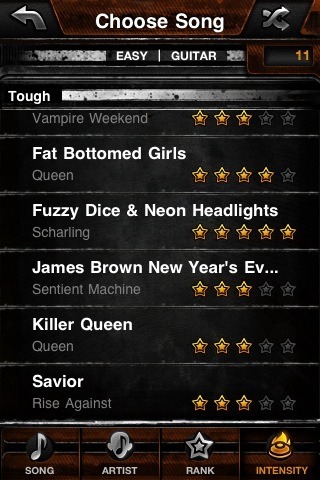 These might be overall targets or for a particular level or even right down to a particular song. 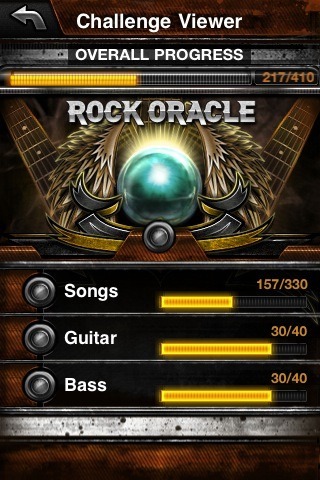 The Rock Oracle will give you a random target out of those you have yet to achieve. 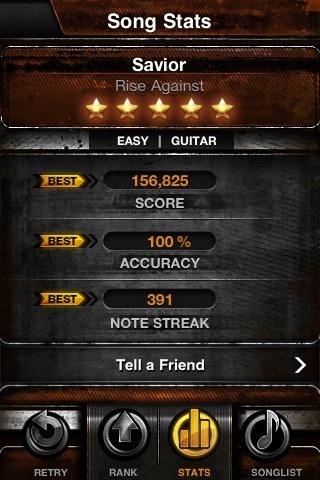 Of course what really want is every note played correctly and with a suitable style to get five stars. That will get you five Gold Stars . All of this will greatly improve your points and that improves your rank/level and that improves your reputation. You get a little guitarist act out great Rock and Roll fantasy. 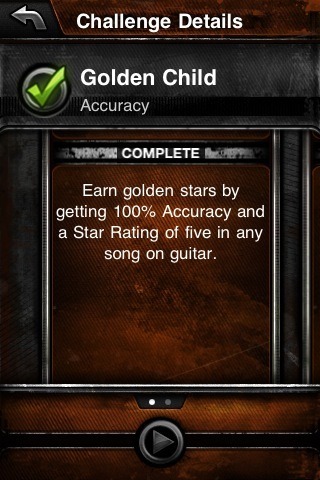 Your performances earn you trinkets, garments and guitars/bases to kit out your lucky doll. As you play or wander through the menus the avatar bounces, frolics and -of course- rocks it’s way about. Most distracting. Especially if dressed in a bikini. All the time you play the background flashes and changes in simulation of a thumping Rock Concert. Luckily there is a Focus mode, this removes all the flashing and strong and also your pretty doll, who otherwise is visible behind the Note Catcher, rockin’ away. A wide array of statistics are kept within the game and it’s well worth takin the odd glance. 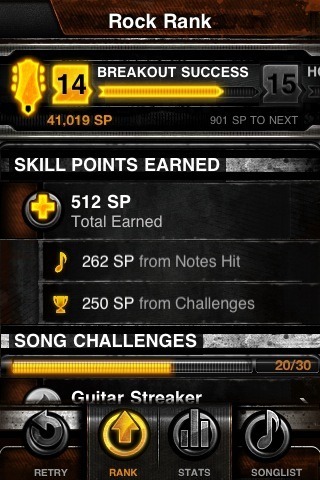 Along with the normal playing stats (number of notes played, stars earned etc.) the game also does some weird stuff – like record how long you spend on each menu. 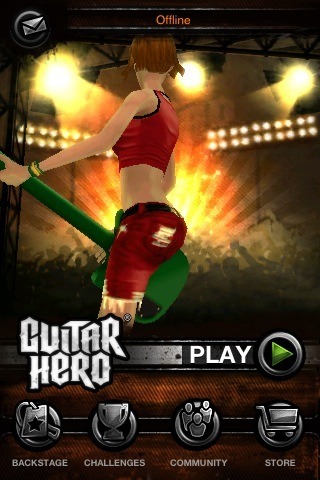 Obviously iPhone apps are cheep but game development like this is not. To compensate we have the normal in app purchases. In this case songs. There are only a few included initially but via the store more can be purchased. These are available in 3-packs and are both dedicated toma single band or mixed. Motorhead, Queen, Alice Cooper and a good few newer acts a available with the packs costing (at time of publication) £1.49. The number of songs does increase slowly over time but is still a little small. 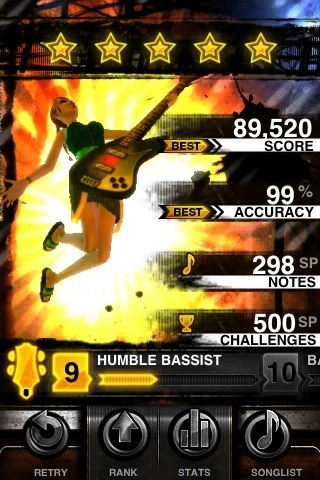 This is probably a a result of the DS heritage of the game, much harder to add new songs to a cartridge. Can’t praise it highly enough. The easy and medium levels give everyone a chance of doing well in the game and hard and expert really challenge your timing. The Focus mode also provides added value on the 3GS. The game does require a fair bit of your iPhone’s resources. Nothing is more frustrating in an obviously good game than finding it stall or jump. 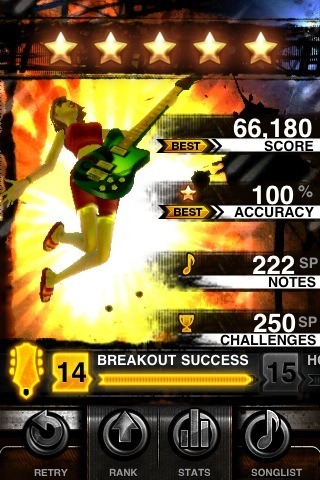 Guitar Hero can do this on the 3GS. All can be fixed though by shutting down all the other apps and using Focus mode. You’ll also find using Airplane Mode will help. The game is playable on the iPad but awkward and clumsy to use, especially when x2 size. 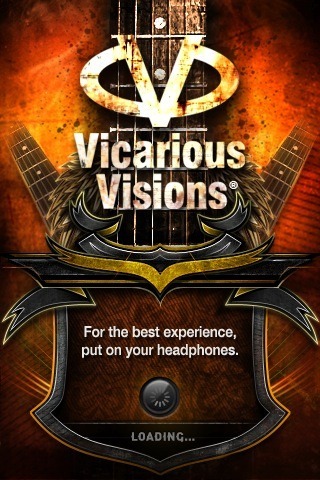 Cost: £1.99 plus in app song purchases. The game does take a lot longer to load than most iPhone games but is worth the wait. 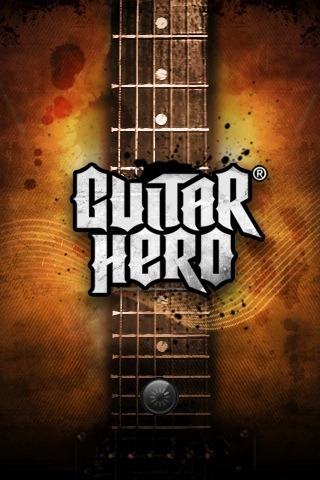 When selecting a song to play you can choose guitar or bass and all four difficulties. Example here of a Sustained Chord. Press the notes when they are anywhere in the Note Catcher, like the green note at the bottom. Example of a distracting background. And another, this time with Star Power activated. Game can be paused at any point and will give you a 3-count back in when you resume. …and a good few skill points earned too. But you can do better! 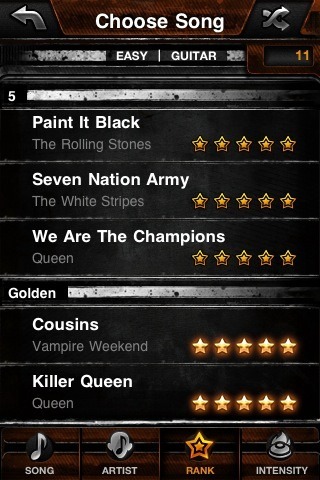 5 Gold Stars! 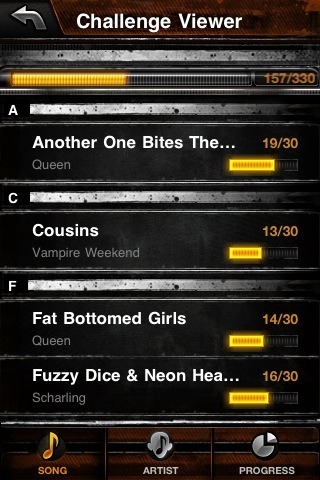 Keeping track of your progress on each song is easy. And that is a good run! Even on Easy.